Kristi Hedges writes about leadership for Forbes and Harvard Business Review and is regularly featured in publications such as The Wall Street Journal, The Financial Times, BBC, Chief Learning Officer and CNBC. Find out more about her published books below. 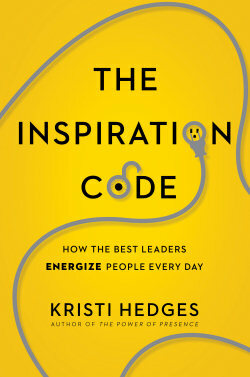 Kristi’s latest book reveals the surprising, everyday actions that any leader can take to be an inspiring and motivating force. Based on significant social science research and interviews with thousands of leaders, Kristi shows how to become a leader who builds commitment and fosters greatness in others. Everybody wants presence, but most don’t know how to get it. In her highly praised first book, translated into multiple languages and newly released in paperback, Kristi demystifies this elusive trait, offering a practical guide for how anyone – regardless of position or personality – can strengthen their impact. — Frank Sesno, Director of The George Washington University’s School of Media and Public Affairs, Former CNN Washington Bureau Chief, and author of Ask More: The Power of Questions to Open Doors, Uncover Solutions and Spark Change. Everyone wants to be the kind of leader who energizes and mobilizes others – yet too few are. Why is it so challenging to crack the code? Eye-opening and accessible, The Inspiration Code dispels common myths about how leaders communicate – and guides them in cultivating qualities that authentically excite. Inspired companies need inspirational leaders. Learn to unlock motivation, lift peoples’ sights, and lead them into the future. Everyone recognizes leaders with “presence.” They stand out for their seemingly innate ability to command attention and inspire commitment. But what is this secret quality they exude, exactly? Executive and CEO coach Kristi Hedges demystifies this elusive trait, revealing that leadership presence is the intersection of outward influencing skills and internal mental conditioning. Using her I-Presence model, the author shows how anyone – regardless of position or personality – can strengthen their impact. Readers will learn how to build trust as the foundation for leadership, eschew perfectionism for authenticity, banish limiting thoughts and behaviors, and galvanize their team through visionary, inspiring communications. Stellar technical knowledge, a strong work ethic, excellent presentation skills – none of these tangible traits puts people on the career fast track as readily as a compelling presence. Filled with profiles of leaders with powerful presence and the latest neuroleadership research translated into actionable habits, this authoritative guide puts a little-understood, but potentially game-changing, tool within everyone’s reach. 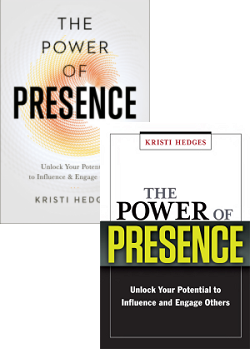 Sign up and receive tools from Kristi’s books and free book chapters.